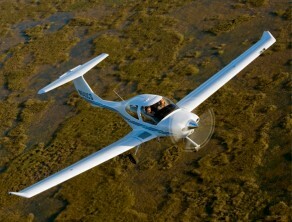 The DA-40 seats four people comfortably. A forward hinged canopy allows access for the pilot and front seat passenger, with a separate access for the rear passengers via a gull wing door in the left fuselage side The cabin structure contains a carbon fibre roll bar aft of the front seats for crash protection. There is plenty of headroom and legroom for all occupants. As in the Katanas the front seats are fixed in position, but don’t have quite the same reclined aspect as in the Katana. Rudder pedals can be easily adjusted. At the 2004 Sun’n Fun Diamond showed the DA40-FP. A fixed pitch version of the DA40-180 DiamondStar, powered by a Lycoming O-360-A4D 180 hp, with a fixed pitch metal Sensenich prop. The DA40 DiamondStar is powered by a Lycoming IO-360-M1A 180 hp engine, with a hydraulic prop governor and a constant speed prop. Range @ cruise: 570 nm. Fuel burn @ cruise: 35 lt/hr. Engine: Thielert TAE turbodiesel, 135 hp. Fuel burn @ cruise: 18.5 lt/hr. Range @ cruise: 750 nm. Wingspan: 39 ft. 6 in. Overall height: 6 ft. 6 in.